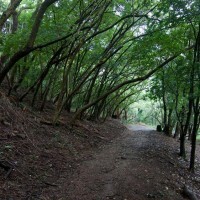 Fernberg from the inside | There once was a creek . . .
Every once in blue moon, to celebrate days of actual or purported national significance, the gates of Government House are thrown open so that us ordinary folk can have a look inside. 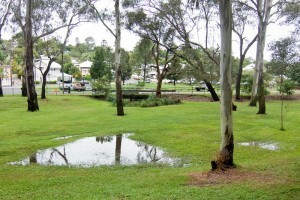 There was an open day planned for the Australia Day weekend, but it was cancelled due to wet weather. Last Sunday (3 June) there was another open day, this time to mark the Queen’s Diamond Jubilee. The weather again was pretty poor, but for the most part the rain held off. And despite still shaking off a bug that had kept me in bed the day before, I wasn’t going to miss this opportunity to see the grounds of Fernberg from the inside. Up until this event, I had managed to completely ignore the Jubilee festivities. And I kept ignoring them as I walked through the gates on Fernberg Road and past all the tents and fanfare. I didn’t even go inside the house: I wasn’t there for that. 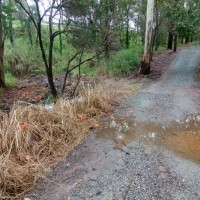 I was there to explore the less regal side of the grounds — for as well as hosting the area’s most distinguished residence, this site also contains some of the largest patches of undeveloped land in the Western Creek catchment. As you enter the property, the first trees you are likely to notice are the large palms and other exotics on the main lawn. These trees even have plaques affixed to them showing their botanical name and country of origin (none that I looked at were from Australia). 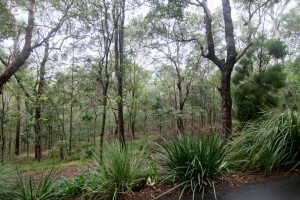 But as you follow the path down the hill, you encounter more native vegetation, some of which has probably been there since before the site was developed. 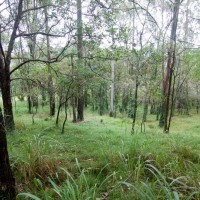 In places, the trees are dense enough and deep enough to pass as native forest. 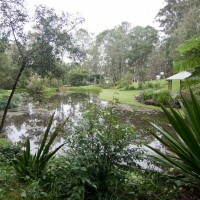 Towards the bottom of the grounds, on the side closest to Murraba Street, the pathway leads to two large ornamental ponds joined in the middle by a small waterfall. 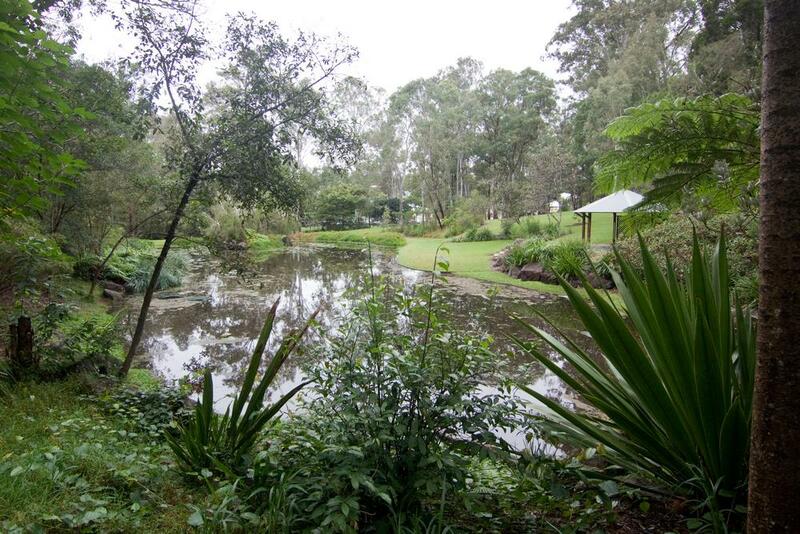 These ponds are artificial, having been constructed in 1987 at the request of the governor of the day.1 The ground has been built up around the lower pond to contain the water, which is sourced partly from onsite drainage and partly from the mains supply. 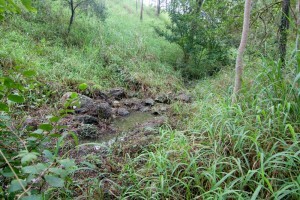 Water is pumped from the lower pond to the upper pond to keep a constant cascade flowing between them. In the lower pond is an island with a weeping melaluca (I don’t know the species) — a nice touch. 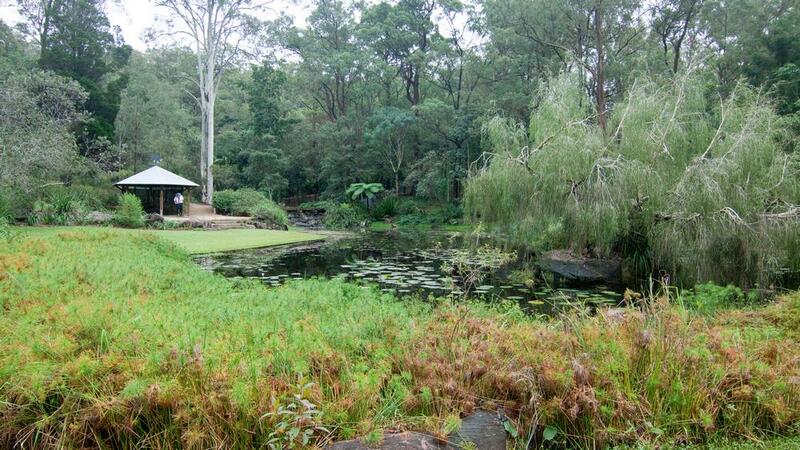 Overlooking the two ponds is a nice gazebo where on pleasant days I assume the governor has high-tea with her guests. Further down the hill and away from the bitumen path, you can see a rather less attractive water feature: the opening to the culvert underneath Murraba Street. This is not much more than a large hole in the ground, overgrown with Chinese elms and a few more native looking specimens. 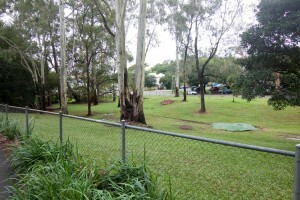 It is surrounded by a fence, and the area that surrounds it is in turn fenced off from the rest of the grounds. 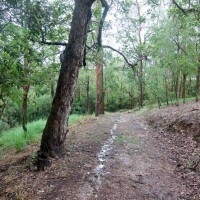 Clearly it is not supposed to warrant any attention, yet to me it is interesting because it lies on the path of the old Western Creek. It may even be part of the original channel. 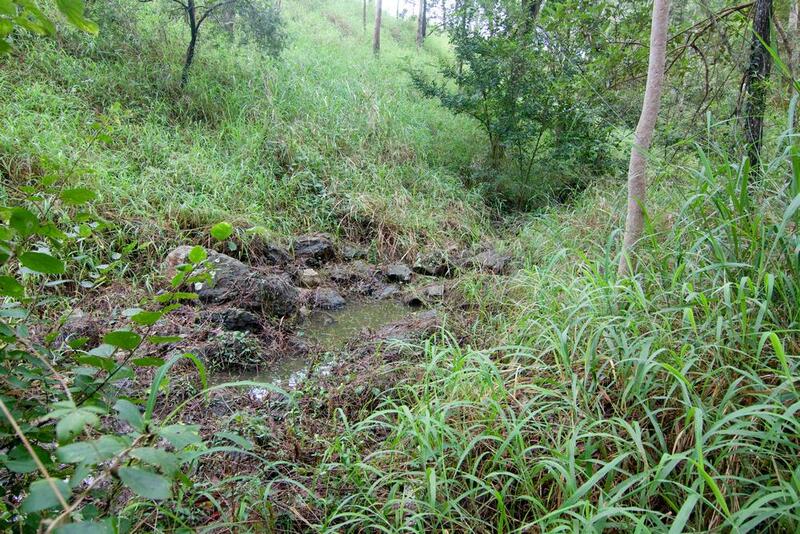 Or It may be a man-made ditch; but there can be little doubt that this is where the creek once flowed. 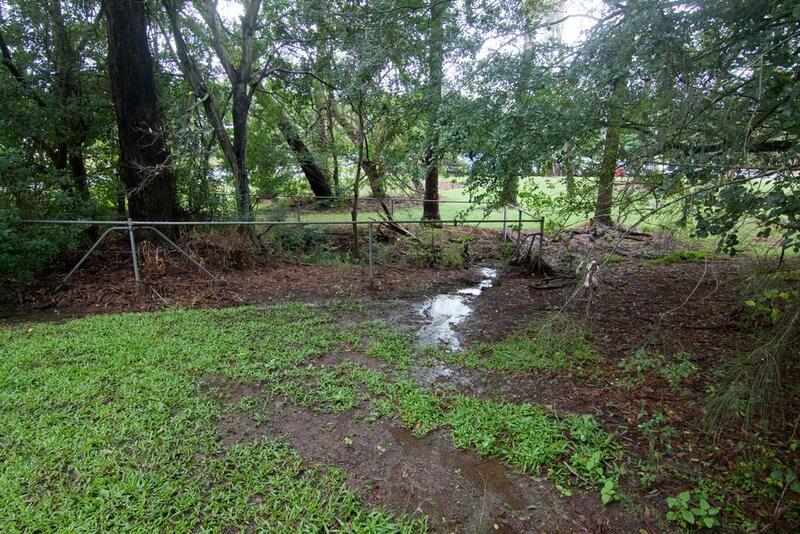 The fenced area surrounding the drain extends 150 metres or so from Murraba Street towards Norman Buchan Park. A guard on duty at the open day told me that this used to be the paddock for the governor’s horses, back in the day when the governor still kept horses and a carriage. Now it keeps in nothing except some trees and the stormwater pipe that replaced the creek. This pipe is partly exposed along much of its length, and at one point it is covered by a large concrete hump. According to the security guard, this is where the pipe burst a few years ago after a torrential downpour. Nobody visits the horse paddock these days, he explained — except to mow it. Actually there is one other interesting thing in the horse paddock: the small pond by the fence at Baroona Road. Despite never running dry, this pond is not artificially watered like the larger ornamental pools. Nor is it fed by the stormwater drain, which runs straight past it. Most likely, this pond is fed by a spring, and there were probably also other springs in the area once upon a time. 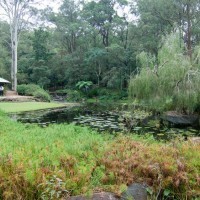 Within the Fernberg grounds, this pond is quite healthy, thanks to some rehabilitation work done in 2007 by members of the Enoggera Creek catchment group Save Our Waterways Now Inc and the neighbouring catchment group Cubberla-Witton Catchment Network working with the Government House gardening staff. On the other side of the road, where the pond protrudes into Norman Buchan Park, it is rather less picturesque. 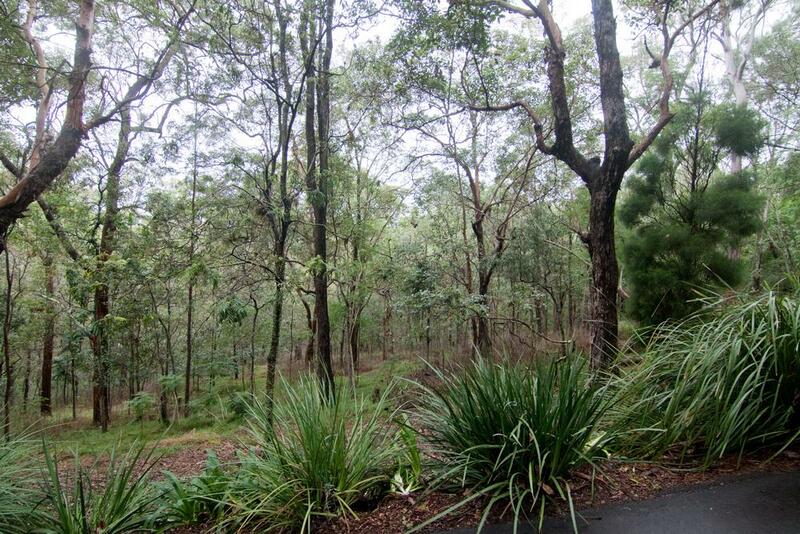 There are few surprises as you walk along the remainder of the slope overlooking Baroona Road and Norman Buchan Park — this much you can see just as well from the other side of the fence. But the western side of the grounds is a different matter. 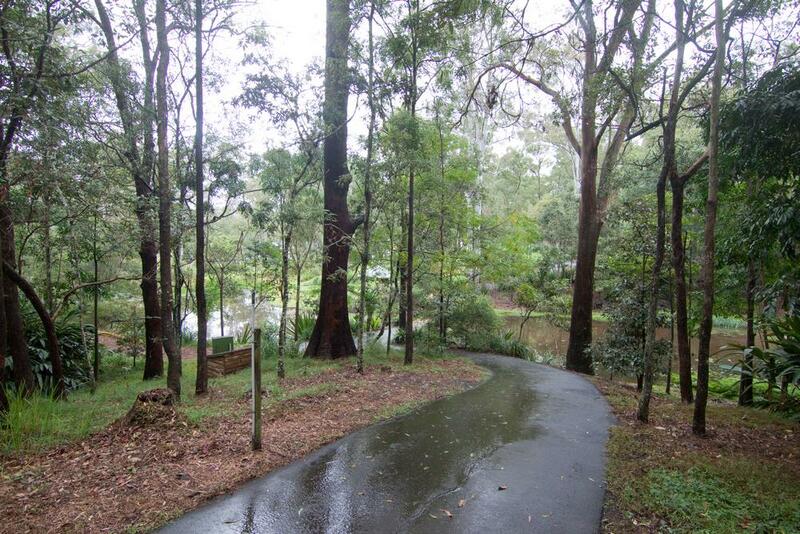 Here there are no gardens, no gazebos and no bitumen paths. And while I was there, there were no people either. This is the backwaters of Fernberg — quite literally — for as I discovered, a creek (of sorts) still runs here. 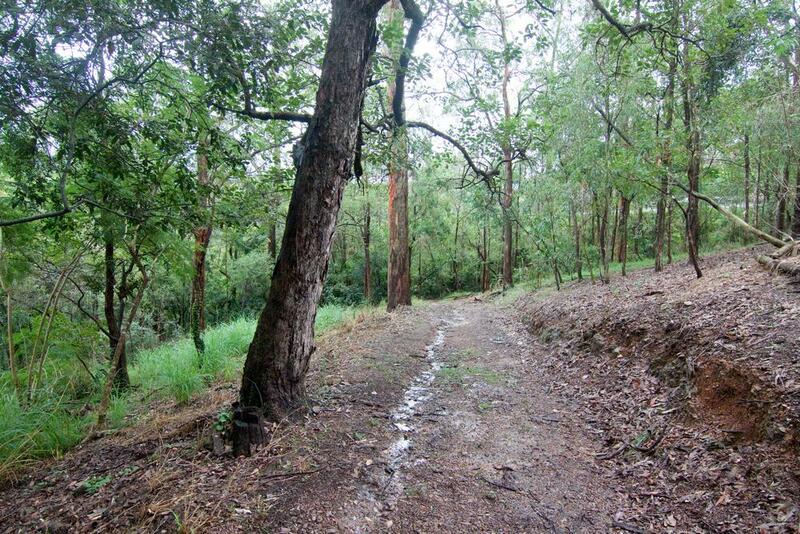 This stream trickles all the way down the hill below the western fenceline, where there is a steep slope rising up to Macgregor Terrace.2 This watercourse is unremarkable, and would have been dry if not for the recent rain. 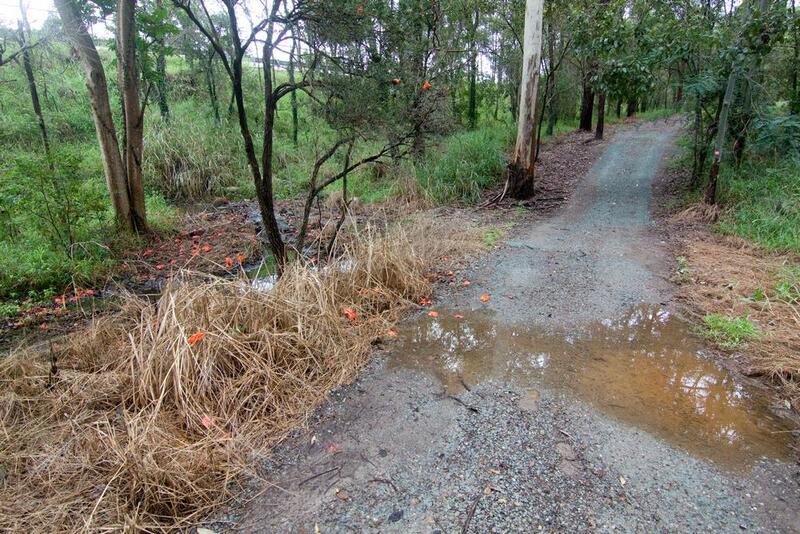 But it is the closest thing to a natural stream you will find between here and the bushland around Tristania Drive and Couldrey Street. 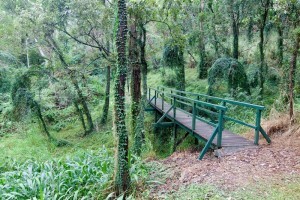 There are also several steep gullies in this area, two of which are crossed by wooden footbridges. There were no noticeable streams when I was there, but I could imagine these gullies gushing during heavy rain. As you head along the path back to the more civilised part of the grounds, you come to a rather attractive grove of Chinese elms. 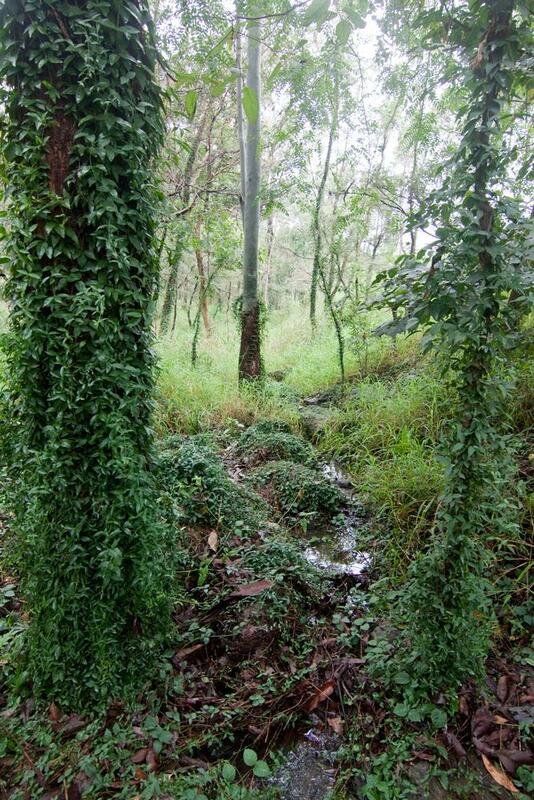 When native bush is cleared and left to its own devices, this highly invasive tree often takes over, leaving little room for native species. Where the path reached the main lawn, it was fenced off, presumably to stop people using it in such a muddy state. Oops. Fernberg was not originally the Governor’s residence. It was built in 1864 by a merchant named Johann Heussler, who lived there until 1872. 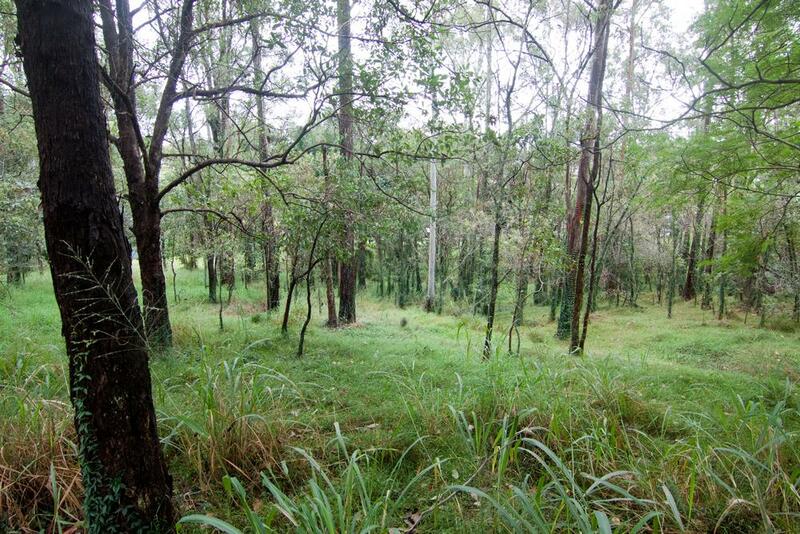 It changed hands a few times in the following decades before being bought by the Queensland Government in 1911. Governor Sir William MacGregor had moved there in 1910 as temporary measure while a new Government House was built in Victoria Park. But the development at Victoria Park was abandoned, and Fernberg was chosen instead as the new Government House.3 For this, I think we can be thankful. Had the property not fallen into government hands, it would have surely been subdivided and filled with houses long ago. 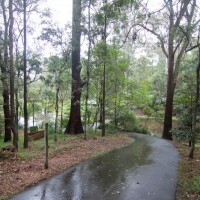 Instead, the inner-western suburbs have inherited an island of relatively undeveloped land — something that provides amenity to the area, habitat to wildlife, and a link to the past. 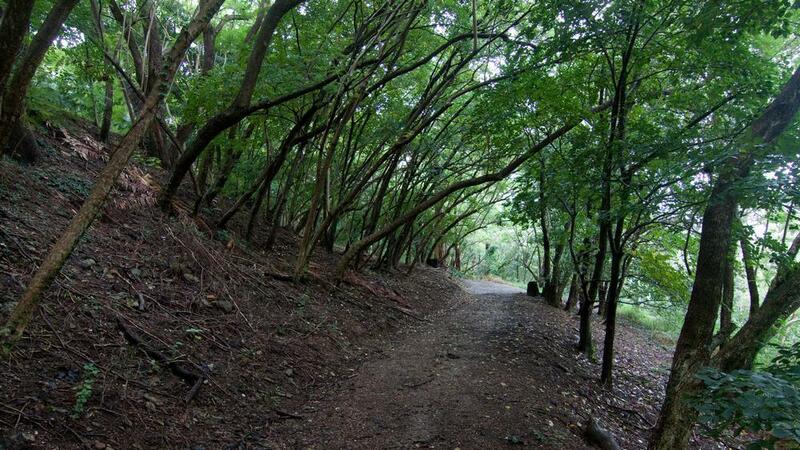 Fernberg is special and valuable partly because it has been fenced off and protected from pressures such as development, overuse, fires, vandalism and rubbish. But must it be locked up so completely? It seems a shame to me that this public asset is publicly inaccessible for all but a few days of the year. And for the rest of the time, it seems to be barely used at all. What would be lost by opening up some parts of the grounds on a more regular basis, even if only during daylight hours on weekends? Admittedly, this might introduce complications. Perhaps more fences would be needed to keep the main part of the grounds separate. Perhaps there would be public liability issues. Perhaps there would be greater maintenance costs. But then again, perhaps the right balance could be struck so that it could be achieved in a manageable way. Aside from making better use of the grounds, there must also be opportunities to enhance their value. 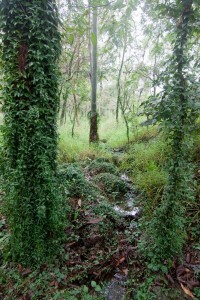 Much of the site is in a kind of limbo, neither bush nor lawn, and the parts that are bush are generally fairly weedy. Could these parts of the grounds be restored to a more natural or ecologically healthy state, perhaps through cooperative involvement of local residents, schools, researchers, catchment groups, and businesses? 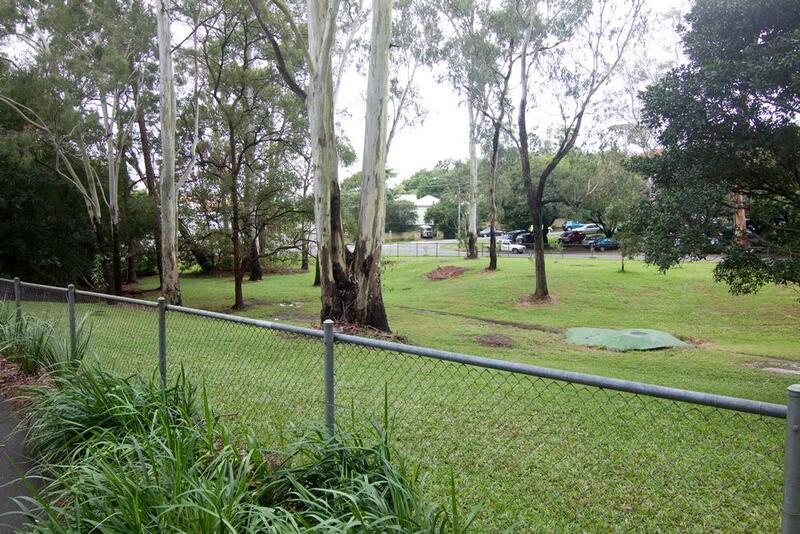 Could this site be the crown jewels of Brisbane’s inner suburbs? Maybe when we become a republic. Pingback: What’s in the Governor’s backyard? | There once was a creek . . .